This pressing seems to have heavy "unfill" on Side D, resulting in a lot of static on the right channel. Can any of you confirm this? Seems to be a MPO pressing. Can anyone comment on the sound of this release? The standard version seems to be pressed quite quietly and has different versions of "The Killing Season" and "The Donald". Great album! 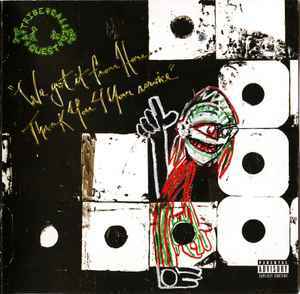 I love how ATCQ evolved their sound musically but still stay true to their rap style and lyric poetry. Also enjoy the guest rappers on this album. Makes it sound like a record of that time (2016) and let's you remember those hip-hop artists that were trending and relevant at that time (again 2016). Rest in peace Phife Dawg! You became the statue to let those know how talented you were! Does anyone know if this version contains the uncensored version of "The Donald"? The version that contains the scratches of a reporter saying "Donald", which rapidly loops over the piano interlude. Happy to have it but I agree with most comments - it's the most uneventful special release ever. Sounds okay... A tad quiet, bass can be muddy at times, and mine came with a pretty big scratch. It doesn't affect play, but still an issue. And no gatefold? For $30 CAD I expected a little more. An excellent return. This could have gone bad but the whole ensemble with guests does not disappoint here. As usual, Ali Shaheed have not lost his professors touch on chopping up beats. He serves up some refreshing stuff here. Modern mixed up with classic soul and r'n'b. This man embodies alot of what ATCQ is in terms of sound. Although its not purely a conscious hip hop album, it throws in a colorful myriad of sounds. I hear neo-soul, dub reggae. Some trademark Jack White-esque vocal processing and plenty distorted guitar. Hell I even hear some classic prog-rock going on in there. Lyric performance still as tight with political messages & Cryptic poetry. I sense a lot of anger in there too pointing towards the Trump electoral and the elitist society.. Still though, all in all, a very solid album from the Tribe. It surely grows on me each listen. If there were 1000 of these pressed, where are they all? !